Olivia Fox Cabane, author of The Charisma Myth, talks with Fast Company about why charisma is so critical to business and how special Jedi mind tricks can help get you there. As a socially inept teenager, Olivia Fox Cabane realized that she had two choices. “Either confine myself to a desert island, or learn how to make this human thing work,” she says. Cabane opted for the latter. Good thing. 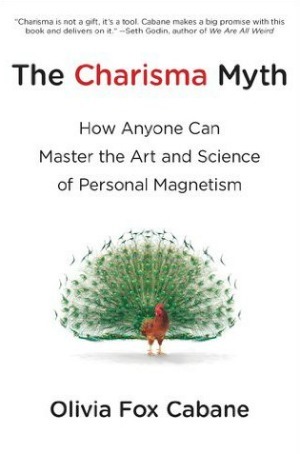 By age 24, the French-born author of The Charisma Myth: How Anyone Can Master the Art and Science of Personal Magnetism, published on March 29, had addressed the United Nations. The following year she was lecturing at Harvard and MIT, a precursor to her career as an executive coach and keynote speaker. A self-professed science nerd, Cabane came up with the idea for a book on charisma after realizing there was no single resource to help individuals cultivate it. We spoke with Cabane about why charisma is so critical to business and how Jedi mind tricks (not the hip-hop group) can help get you there. FAST COMPANY: So what is the myth of charisma and where did it come from? OLIVIA FOX CABANE: It came from the Greeks, who coined the word as “gift of grace.” They believed it was a divine gift. The myth is that charisma is not innate. What scientists have actually discovered–like many other myths they busted this one–is it’s actually a social skill, which like many others is learned. But this happens so early in life that by the time these charismatics get to adulthood, it all seems to be natural. And yet if, for example, you analyze the progression of Steve Jobs from 1984 to 2011 you’ll see he painstakingly learned it step by step. So where did we get the idea that one needs to be outgoing and gregarious to be charismatic? A few things. First, people don’t realize that charisma is not monolithic. There’s no one form of charisma that is good or bad per se. There’s only the right form of charisma for the particular situation. Our Western culture glamorizes extroversion, and so the 50% of the population who are introverts feel defective and uncool. But you know what? Introversion is actually an asset for several forms of charisma. For “focus charisma,” which creates a cocoon around people and gets them to share everything, introversion is actually a key, critical component because you need to completely focus your attention on a person and listen attentively. What about the three other styles of charisma? There’s “authority charisma,” which is the most powerful form of charisma. It’s the one that will get people to listen and obey. However, authority charisma has several downsides, as do the others. With this one, though, it inhibits critical feedback and is a killer for brainstorming. It’s not one I’d recommend bringing into a company or to a team if you want them to be creative. Exactly. This form of charisma is one that can make people feel inspired and want to follow you. It’s also great for invigorating brainstorming. But remember, there was a very different Steve Jobs in private. His public persona was very carefully crafted. The other type of charisma is “kindness,” which is what the Dalai Lama has. This encourages people to reveal their hearts and souls, which is wonderful and flattering. People start bending rules for you or pretending they don’t even exist, but it can also backfire because people start falling in love with you, not romantically. But they can get very hurt when they find that you don’t reciprocate. Can you talk about the big advantages that make charisma so critical in business? Charisma makes people want to want to trust and follow you. Imagine if you knew that the moment you entered the room people would want to know what you have to say. It causes people to have a personal sense of sacrifice and go above and beyond the call of duty to advance the leader’s mission. Employees of charismatic leaders also experience greater work satisfaction, greater personal commitment, and exhibit higher productivity. The companies with charismatic CEOs enjoy higher stock prices, and a charismatic CEO has a particularly strong effect during financial turmoil in raising funds for his or her company. But charisma is not just for those in leadership roles. It’s charisma that helps determine which ideas get adopted and how effectively your projects are implemented. For example, charisma is critical anytime you’re applying for a job. No matter what their position, charismatic people also receive higher performance ratings. They tend to enjoy higher salaries and get more promotions. And they’re viewed as more attractive by their superiors. And this can all be backed up by science? Indeed. For example, in controlled lab experiments it was discovered that people could lower and raise their level of charisma, like turning a dial. More specifically, the MIT media lab looked at how critical your body language is to your effectiveness. They were able to predict the outcomes of sales calls, negotiations, and business plan pitches with 87% accuracy not by listening to a single word of content, but by analyzing voice fluctuations and the facial expressions of the person pitching. Charisma is what enables one sales person to outsell the other five in his district combined. Can you talk a little more about the science of body language and its impact on charisma? There are two critical things you need to know about body language. First, we can’t fake charismatic body language. Even when we control the main expression on our face, if what’s deeper inside is anti-charismatic, that will come out. That’s because, no matter how well we think we’re controlling our facial expression, micro-facial expressions will still appear. And even if they’re as short as 17-32 milliseconds, people will be able to detect them. Secondly, you don’t control your body language consciously. Finally, you control your subconscious mind, which is why so much of this book is actually Jedi mind tricks, like doing visualizations. For example, one way to both feel and broadcast confidence is by imagining yourself puffing up like a big gorilla. Because of the way visuals hit our limbic brain faster than our cortex, it’s one technique that can get your body language instantly to a charismatic state. The secret is to get you into the right charismatic mind to teach you to get a charismatic brain so you then exhibit the right charismatic body language so that then you are charismatic. You said we can’t fake charismatic body language, but can we fake charisma? Are there people who seem to be charismatic but really aren’t? No. Either they’re charismatic or not. It’s that simple. And if they are charismatic, it’s because internally they’re doing the right Jedi mind tricks. Now they may be insincere at a deeper level, but in the moment, like all good megalomaniacs, they believe what it is they’re doing. Now I’m not saying charisma isn’t potentially dangerous. It is. Which is why the last section of my book is called “Use It Responsibly.” This stuff is powerful and could have terribly disastrous effects. You can get people to do whatever you want them to do. Think about that. How is charisma useful in difficult business situations? So charisma is perfect when you have to deal with a particularly difficult person and you have to win their trust and rebuild the relationship. You could turn on either focus or warmth charisma, which will enable you to establish an emotional bond with pretty much anyone. You talk a lot about Bill Clinton. Why is he such a great example? Because Clinton is one of the few figures who leads with warmth. Most other people lead with power or focus or they’re not charismatic at all. He has all three elements. He’s got presence. He’s fully focused on making you feel like you’re the only person in the room. He’s got power obviously; he’s a high-status individual. And he’s got warmth because that is what he broadcasts. That’s what makes him superstar charismatic. He leads more with focus. He leads with intelligence. He doesn’t lead as much with warmth, which is one of the reasons he’s struggling a bit. People are less forgiving of him. Someone who leads with warmth will be forgiven for anything. You offer many science-backed techniques, but won’t they appear contrived if a newbie tries to follow them? That’s why first, we’re doing Jedi mind tricks. We’re going straight to the mind, so that you actually are sincere. I also always recommend practicing new things that might make you uncomfortable in low-stakes situations like the checkout counter of a grocery store. Don’t try something big or new in a high-stakes environment. Do you find yourself constantly assessing others’ level of charisma, even when you’re off the clock, so to speak? Not really. Because I like being off duty.